This entry was posted in Business Development, Uncategorized and tagged Affiliate marketing, Start online business. I have read this verse of the Scripture time without number but the kind of revelation I got from it this morning was mind blowing. In this Bible passage Jesus through His ACTION told us the position we ought to occupy when we see the crowd. You cannot claim to be the head while you mix yourself up with the crowd. It is no arrogance to work on yourself to the extent that you become positioned at the helm of affairs in your industry. Trust me, if you continue with the crowd, with time you will get lost. When you discover that your industry is becoming populated with crowd at the plain, it is a divine calling to move up to the mountain. Why? It is at the mountain that the spotlight falls on you. At the mountain, you see and can be seen. When you speak, you can be heard. Every field of life has its mountain. And those who remain at the valley never amounts to anything. They end up as followers, copycats and always ever learning people and never able to come to full knowledge of the truth. At the mountain top of your career, not everyone will be privileged to know the principles of your success except those who deserve you and strongly want to learn from you – others end up as fans. No matter how intelligent you are, until you work yourself up the mountain of your industry or career, most people may never hear nor see you. They are people whose destinies are connected to you that may never see getting to the industry-mountain as something doable until you do it. None of the disciples of Christ ever thought of moving up to the mountain when they were almost overtaken by the crowd until Jesus set the pace. And today, bear it in mind that they are people whose rising you are delaying when you refuse to move up. I charge you today to come up to the mountain where you can see and be seen, and you will be glad to you did. This entry was posted in Uncategorized and tagged Biblical business principle, Career. 7. “It is not only possible you will succeed, it is also necessary. When you see yourself shouldering the destinies of millions of people all over the world, the capacity and sagacity to stand tall and firm will supernaturally fall on you. Most people will not believe in your gifting and divine talent until you give it a voice. 2 years ago, once upon a friend never believed I could amount to anything, so he never considered it an abomination to make jest of me in the public (and even in Church) – calling me different names as he laughed on. He tried his best to discourage me in my writing career. On several occasions he mentioned names of few people that failed, including himself and begged me not waste my time. Why all these things continued, my Pastor Uzoigwe Samuel Abraham never stopped calling me “Emma Wonder”. That nickname he awarded me suddenly started taking form. I turned out to be a wonder that the world will wonder about like he often prayed for me. It also became a great motivation for me. It made me have great interest for excellence. So when the call to become a Motivational Speaker came I was never in doubt if it was real or not. Now, I have a working dream, a testimony of God’s faithfulness and will definitely not graduate as a job seeker. He got it all wrong. 1. Discouragement to your dreams won’t come from someone you don’t know. 2. Anyone who discourages you is afraid of you rising higher than him or her. 3. If God said go, don’t ask “why?” Take off first then the “why” will naturally unfold itself to you. 4. Those who undermined you when you took off in the journey to your glorious destiny will be so humbled by every successful move you made. If the person is still your friend on facebook he won’t comment on your achievement. 5. Never never forget to acknowledge those who were of great support to your rising. And always pray for God’s super abundant favour on them. Finally, let your biggest motivations rise from within as they are inspired by God. Everything anyone else tries to do is an addendum. Are you intending to embark on starting a new business from scratch or expanding your already existing business? Do you want to learn how starting a business part-time can help you avoid the risk of experiencing a fatal business failure? Do you want to know why most successful businesspeople started off first by working part-time? Or you want to know why I recommend that you start your business part-time first? Well, if you answered yes to all those questions, then I advice you read on because this article is specifically written for you. In my previous post on How to Achieve Success Working Part-Time, I told us how to use the Magic of Part-Time in generating uncommon wealth. I also told you things you need to know about working part-time and if I can remember vividly, I promised to tell you Why I Suggest You Start Part-Time. Today, I have come to fulfill my promise but for clarity, I have titled it, “Top Reasons Why Starting Your Business Part-Time is good for you.” This article is poised to challenge you and of course unveil the secrets hidden for ages why some businesses hardly experience business downturn. Record shows that 65 percent of Small and Medium scale enterprises close down after 3 years of start up and to a great extent this has being a great pool of headache to me. It was a part of my reasons why I didn’t want to become a successful entrepreneur alone but to help others become successful too. I came to realise that some of the reasons why these small and medium scale businesses went down the drain was because they never cared to test the ground upon which they sheepishly sow all the proceedings of their life. They did what I call ‘uncalculated risk’ and no wonder they crashed so easily. The consequence has to tell on them and no doubt, there’s no way they can outsmart it than start all over again. This is something that was avoidable if they had mastered the Act of Starting Part-Time. If you want to achieve success early enough in life, I am of the opinion that you start part-time. For instance, you are in school but you wish to go into business after getting your first degree, I suggest you start part-time. If you are working on a full-time job now but wish to become a business owner in future, start part-time. Don’t quit your job too early until you have mastered the world of business to an extent, otherwise you may regret ever being in business. They are countless number of skills you will learn while working part-time. Not only will you learn those entrepreneurship skills, you will also have the liberty of less risk to test run your ideas if it has a market value, a trans-generational standard and lots more. Notwithstanding all the great articles you see on this blog I am still working on it part-time although my part-time has produced more result than those who have invested all their life in it. Do you know that intelligent hiring companies are more willing to work with part-timers than they are ready to work with full-timers? With part-timers the employers save more money and still get the same result if not more than. This is because part-time workers are more conscious of time than full-time workers can ever be. Each day they have a goal they must meet to earn a pay which they must reach. Recently, in the US, employers are beginning to see into the potential profits in hiring part-time workers as a means of cutting cost by all measures. Now, do you wish to become a successful entrepreneur? Listen to my instruction and start part-time. I wish to see you at the top. Thank you. If you think this blog is of great value to you please like it, follow me for other subsequent great post and don’t read this alone. Share it with friends and loved ones on facebook, twitter and google+. This entry was posted in Personal Development, Uncategorized and tagged How to become successful working part-time, Part-time job, The Magic of part-time. very peak? Do you wish to stir up the giant within you? Then this article is written specifically for you. 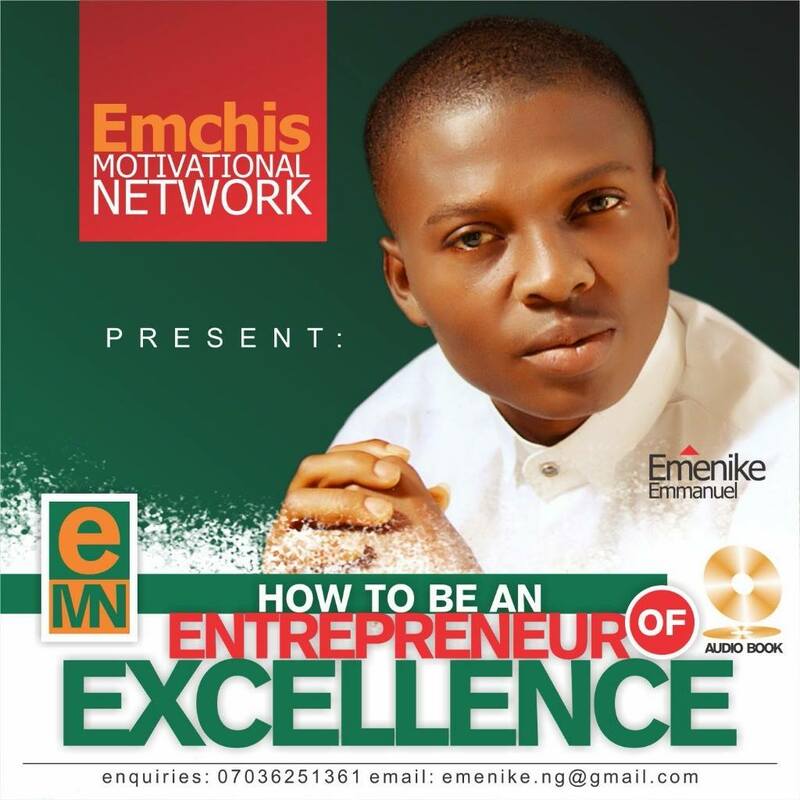 This entry was posted in Uncategorized and tagged Emenike Emmanuel, Powerful quotes, Quotes, Stir up the giant within you. People come into business for different reasons, and there’s no doubt these things affect the way they do business. The question is, why are you in business? Or what’s driving your passion to come into business? Most people go into business for the wrong reason and for those reasons some of them make the worst of businesses. 3. Quest for retaliation and many more. Outside for the purpose of making impact, I see no other reason for going into business. Business should be for the purpose helping others. Before I finally take my hands off the keyboard let me ask you again, why are in business? This entry was posted in Uncategorized and tagged Business, Why Are You in Business?, Wrong motive for being in business.